Today we will learn how to Install .NET in IIS. 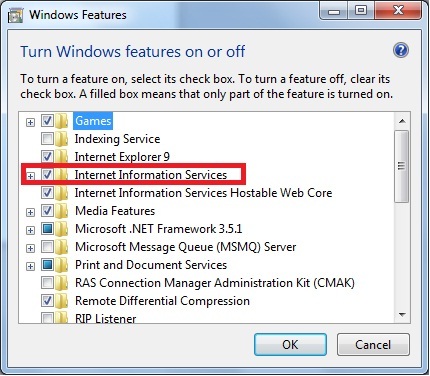 By default IIS is turned Off. To Turn on we will go to Control panel > programs > turn windows feature on or off. Check all options by Expanding and Make sure that you got the Internet Information Services checked fully as in Above screen. Then you need not to install any more scripts to host asp.net websites. You should Install ASP.NET (configure IIS for ASP.NET). First Decide what version are you using. ASP.NET 1.0, 1.1, 2.0, 3, 3.5 , 4 or 4.5 (if Installed). C:\Windows\Microsoft.NET\Framework>cd v4. *      //installing ASP.NET V4.0 here. 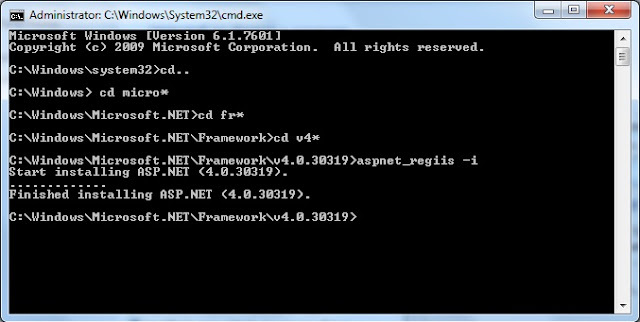 Command Prompt will Install Code and You are now Ready to Access your ASP.NET Site with Localhost. I followed your tutorial and really found it easy to have ASP.NET in IIS. Without an error this worked fine for me. Thanks, It is nice to hear that someone got help by my posts.